Staff access to 2018-9 modules are now available after the roll forward from the previous session. 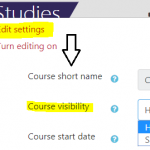 Use the Course Overview filters to manage which courses appear in your Moodle dashboard. These are empty course shells and so contents from previous versions need to be imported. Here you will find guidance for preparing modules for the new academic session, and for further help and support contact your campus Learning Technology Advisor. Note: due to timetabling requirements students are now enrolled on modules across all trimesters at the start of the academic year. 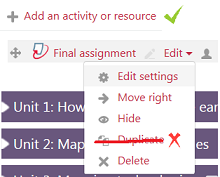 Since students now have access to modules earlier than previously then you may wish to hide content that is under development. 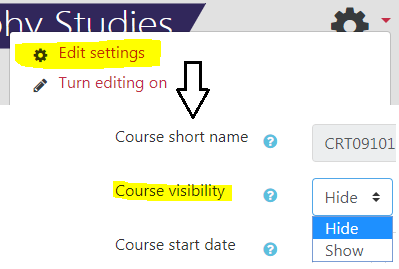 Alternatively you may wish to hide the module entirely by editing the course settings and changing the visibility to ‘show’, and this hides the module link in the student’s course overview. The usual method is to import the contents from a previous version and this is the best method for an empty course. The other option is a backup/restore method to completely overwrite, and there are brief intructions for both methods available from this page. Imported Turnitin assignments (and WebPA assessments) should be deleted and new ones created using the Add and activity or resource menu. Since these are external tools do not use the Duplicate option as this will cause errors. Note that if you have multiple student groups and wish to separate their Turnitin submissions then you can still use a single assignment with the Separate Groups setting (see page 9 of the eSubmission staff guide). Modules may have multiple occurrences running each trimester or over the academic session, so check with your school office if you are in doubt about which students are enrolled on which. You may wish to join (crosslist) module occurrences into a single Moodle course (XL code) and your school/programme administrator can help with this. Further information is available from this page. Check that the correct members of staff are enrolled on the module and notify School/Programme administrators of any changes required. You can do this from Participants at the top-left side panel. Since enrolments have roll over from year to year there will be members of staff who are no longer teaching on the module and should be removed. This is a good time to contact your subject librarian and ensure that the resources you need are available to you and your students in the Library, and that reading lists, eJournal links and digitised book chapters are available in Moodle. The University uses Leganto to provide online reading lists in Moodle and your Librarian can input module reading lists into Leganto on your behalf, checking if items are currently available in the Library or whether new resources may be required. If you have found on online copy of a book chapter or a journal article then you can link directly to the item on the publisher’s website from Moodle (see this Library helpsheet), or use Leganto to include it with the rest of your reading list. If a book chapter is not available electronically then it can be digitised and supplied as a dynamic link under the terms of the University’s CLA Higher Education Licence. It is very important that the University does not breach this licence, therefore if you are re-using any older digitised PDFs then please contact your Librarian who can review these for you. view your course on your mobile device. Clear out redundant questions and/or duplicates before any of your quizzes are available to students. Consider moving questions to categories as this can make it easier to manage the question database and selecting questions in quizzes. If time permits, and you’ve experienced problems with inherited naming conventions you might wish to rename questions to make them easier to administer within quizzes.